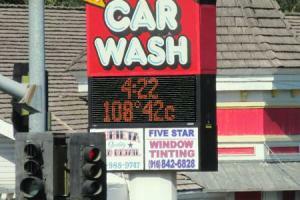 Last summer we worried a lot about our cooling system. Driving around in 108-degree heat will do that, particularly when you have a 40-year-old engine and water pump, and you had massive cooling problems when you first got the car running. In contrast, this summer our cooling system is working perfectly, which we attribute to our new water pump and modern hoses, as well as our oversized aluminum radiator. Driving around in 108-degree heat is not an issue anymore, except of course for the heat, now that we've learned to totally ignore our temperature gauge. Keeping an MGB cool was never a sure thing. The cars were designed and built in a country where two straight days of 85 degree (30 C.) temperatures could shut down Parliament. 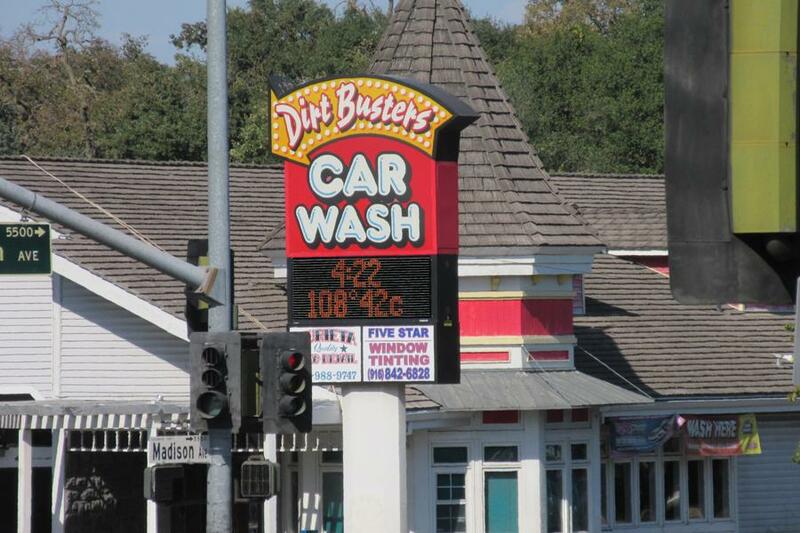 Most of our early experience with M.G.s was in the chilly confines of the San Francisco Bay Area, and the only time we ever noticed a cooling problem was when a hose or radiator or water pump would fail, which was never more than about once a week. Fortunately, in those days replacement parts were usually within walking distance, and all gas stations had water hoses right next to the pumps. Early MGBs came with real water temperature gauges with numbers that told you exactly how hot the coolant was. In degrees, usually Fahrenheit. This allowed you to use your own judgment to determine what to do about it, like for instance stop or keep going. Later MGBs, like for instance ours, have only three marks on the gauge, Cold, Hot, and Normal. Cold and Hot are useless, and Normal is totally presumptuous, as if only a single temperature in the wide spectrum of perfectly acceptable engine temperatures is considered "Normal". 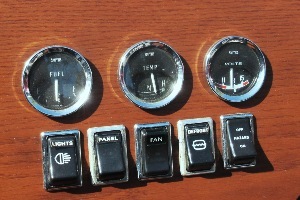 In an MGB, Normal is 100-110 degrees hotter than whatever the ambient temperature is. If it's a balmy 75 degrees outside, the gauge needle is straight in the middle, right where the thermostat opens. Anything warmer, though, and the needle starts to climb, which in our current automotive culture is a sure-fire indication of a major problem. Modern drivers want things to be Normal, all the time. Modern gauge manufacturers understand this cultural need, and produce coolant gauges that indicate Normal over a wide range of temperatures. 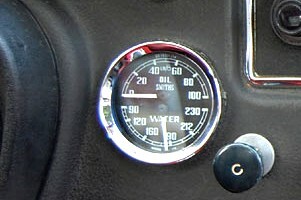 Between about 180 and 210 degrees, a modern gauge will point right in the middle. At 220 it may start to creep upward, but not until it reaches around 250 will it get your attention, assuming you're not on your cell phone and are actually paying attention. Otherwise you'll have to wait until the steam and pungent odor of boiling anti-freeze pour into the cockpit. Our gauge isn't one of those modern gauges. At 220—"Normal" on a 110-degree day—our gauge is only millimeters from the H mark. Which is why we learned to ignore it. All of this is our semi-rational excuse for not replacing our 10" Spal electric cooling fan with a larger one, something we suggested we might do last year when we noticed a tendency for the temperature to creep up at long stoplights. As it turned out, a few weeks ago we pulled the bonnet and took a look at the fan, and after contemplating the installation for a bit we determined that replacing it would require fabricating a new mount, and it was right about then that we realized our cooling system had been working perfectly all along. We have had a couple of other incidents recently, though. In a span of about one week we lost both our tach and speedometer. The loss of the rev-counter was annoying, since we paid a fortune for it on eBay less than a year ago, but the failure of the speedometer was far more critical, because it meant we could no longer keep track of our mileage. We replaced the tach with another eBay unit from Turkey, and the speedo with an eBay unit from a few miles down the road, and so we're okay for now but we figure we lost an estimated 350 miles during the crisis. At first we thought we could fix the speedo­meter. The tiny nylon pawl that pushes the odometer gear had fallen off due to a badly-worn retaining clip, and we thought we could just re-attach it, but three things: 1) after 40 years of valiantly holding the pawl in place, the retaining clip's retaining days were over, 2) the spring that holds the pawl against the drive gear gear was MIA. 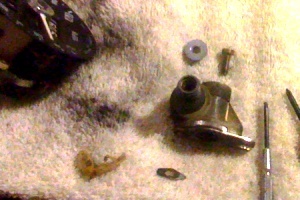 Hard to imagine how it disappeared inside a nearly hermetically-sealed housing, but that's the way it goes sometimes, and 3) the parts were really tiny. As it turns out, we have fat fingers, at least by tiny speedometer parts standards. 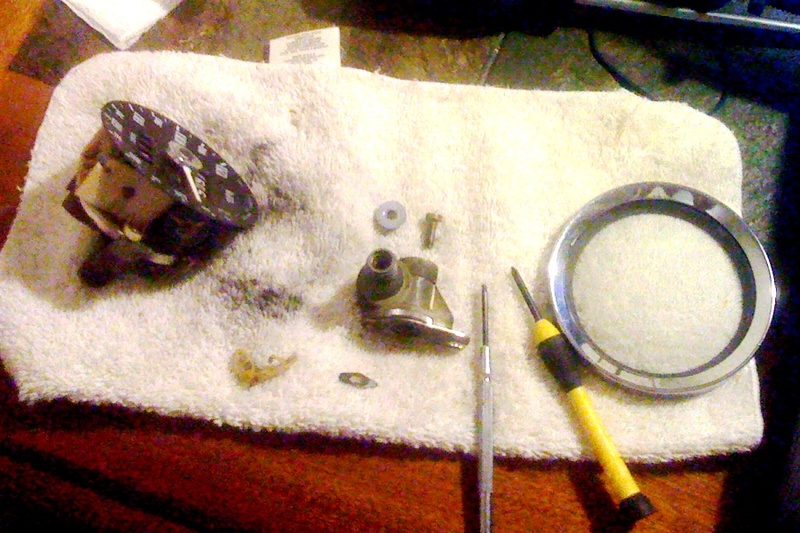 So we left the old speedometer in tiny pieces on the workbench and ordered a new one off eBay. Or not new, but you know, new to us. 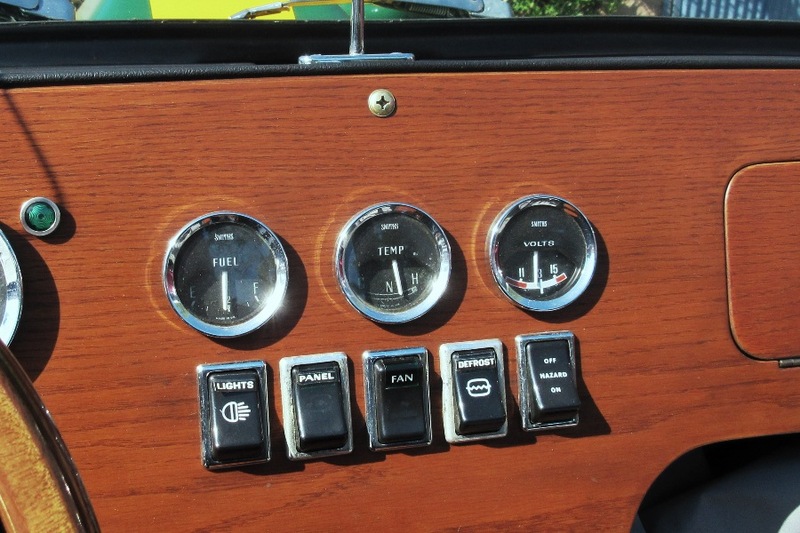 We installed it easily enough, along with our Turkish tach, and now all of the gauges are working again, knock on wood. 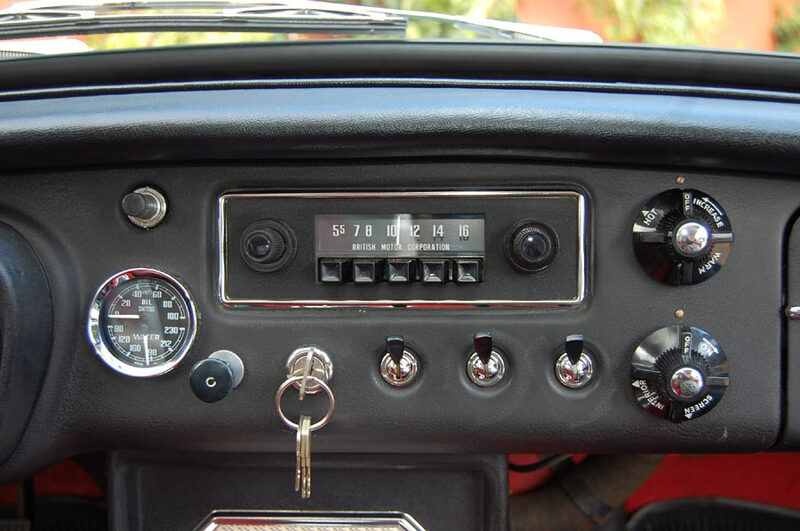 As a bonus, the speedometer needle no longer bounces all over the place, although the speed it indicates obviously has no connection with reality. Not that we pay any attention to it, but we are slaves to the mileage, so we hope at least that's accurate. Quick shift knob update. 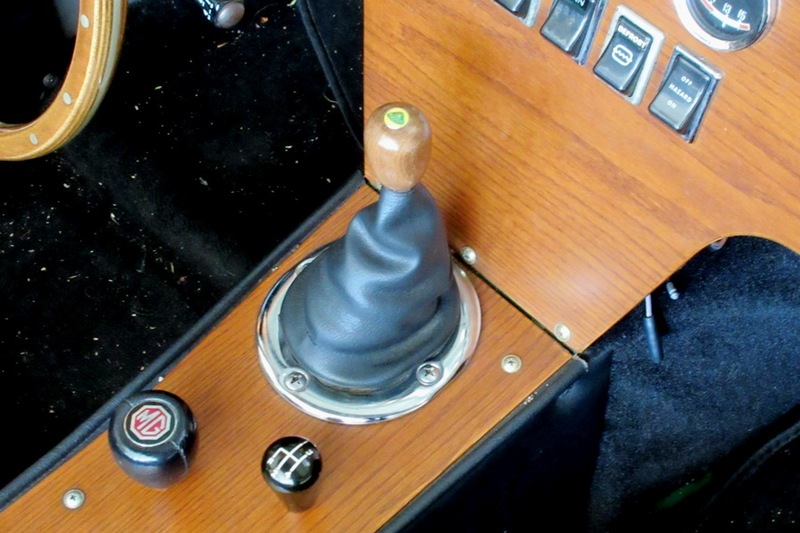 Shortly after we replaced our oversized leather shift knob with a sleek, early-MGB OEM knob, as detailed in last month's episode, a birthday rolled around. 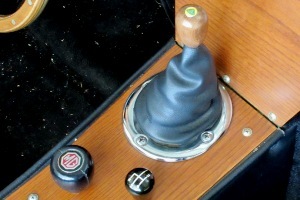 Our best gift from that event was a beautiful wood-grain knob embossed with an official Lotus badge. Naturally the screw threads didn't fit, but using our recent painful experience with the OEM knob as a guide, we levered out the brass insert, drilled and tapped it in a vise, and epoxied it back in. Looks great, feels even better, and matches our all-wood interior perfectly. So that's about it for now. If our report seems a little thin this month, it might have something to do with having spent most of August in Houston, Texas on a project for work. Timing was such that we couldn't drive the Locost halfway across the country, so the car sat in the garage, untouched for the longest stretch of time since our first drive two years ago. But it's back on the road again, running as well as ever with its new gauges and shift knob, and we should have lots more to report in the coming weeks.